Southold’s Board of Trustees has submitted a grant application to cover half the cost of a two-year study to examine bacteria in a number of town creeks. Southold Town is considering a pair of amendments to the town code that could affect waterfront property owners. The changes were among the topics discussed at Saturday’s meeting of SoutholdVOICE, a nonprofit promoting awareness of issues affecting shoreline and marine resources. When does renovation become demolition? That’s how town Board of Trustees president John Bredemeyer described the damaged docks that now line Southold’s creeks and bays. The historically cold winter, and the freezing and re-freezing that has come with it, has broken and splintered dozens, if not hundreds, of the wooden structures. The overpopulation of deer is increasingly affecting the human and natural landscape in Southold Town. It is directly and indirectly impacting our water quality, our shoreline bluffs, headlands and wetlands. 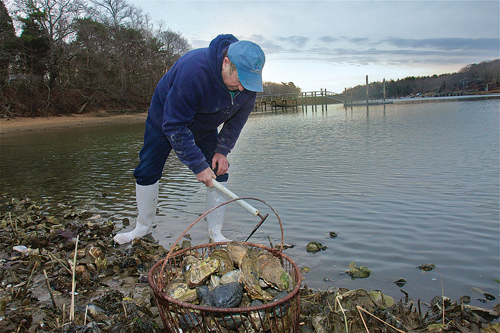 BARBARAELLEN KOCH PHOTO | Southold trustee and bayman Jim King harvests oysters and clams in Mattituck Inlet last week. Local baymen have some more underwater acreage from which to gather clams and oysters this winter. State Department of Environmental Conservation officials announced last week that from Jan. 15 through April 15, commercial and recreational fishermen can harvest shellfish from about 52 acres of Mattituck Creek. Up to now it’s been illegal to harvest or sell shellfish from that area. The acreage will remain open so long as no more than three inches of rainfall is recorded per day for seven consecutive days, state officials said. This is an area that was routinely closed to baymen throughout much of the 1980s and 1990s, and its progress didn’t come simply by the work of Mother Nature. Since about 1995, the then newly elected town Trustee Jim King began testing area creeks previously closed by the DEC in hopes of identifying specific sources of pollution. Using the collected data, he and the other Trustees began working with town engineers to mitigate stormwater runoff coming in from nearby roads and homes, since it was the runoff that was found to be affecting the creek’s water quality. The added drainage system improved water quality enough for the DEC to start opening the creek on a conditional basis. It has been re-opened a number of times since 2000, DEC officials said. Mr. King, who is still a Trustee, continues to do sampling while the creek is open, checking its water after rainfall and snowy conditions, he said, adding that a number of people make the testing program possible — from those who transport samples to Stony Brook, to the owner of Braun Seafood in Cutchogue, who continuously donates ice to keep samples cool on their trip west. Mr. Bredemeyer and the committee have extended Mr. King’s efforts, sampling waters in the Cutchogue creek complex, which includes East Creek, Mud Creek and Broadwater Cove. These Peconic Bay creeks have been closed to shellfishing since 2004 due to water quality concerns. Their hope is to get Mattituck Creek and the other creeks re-certified as regular shellfishing areas for baymen. “There’s a benefit to everybody if we can get some of these creeks reopened,” Mr. King said. For updated information regarding the status of Mattituck Creek after a rainfall, call Southold Town at 765-3912. CARRIE MILLER PHOTO | Southold town council members James Dinizio (left) and Robert Ghosio at Thursday morning’s inauguration as highway superintendent Vincent Orlando looks on. Newly elected Southold Town officials were sworn in last Thursday during an inauguration ceremony held at Town Hall. Southold Supervisor Scott Russell greeted the newly elected officials, who took their oath of office led by Southold Justice Rudy Bruer. Town Board members James Dinizio and the newly elected Robert Ghosio, formerly a town trustee, were among those sworn in. Mr. Ghozio said he was excited to get involved in issues beyond environmental sensitivity and wetlands. “I think we have a few good issues this year,” Mr. Ghosio said. “Certainly we hope to resolve the issues with Vineyard 48, which seems to be moving along … and trying to start working towards a resolution to the problems that we have with the amount of deer that we have in town. “It’s going to be a learning curve for sure. Even though I have been working in the town for seven years, now I get to learn about the other departments I never had anything to do with,” he added. The Town Board will need to appoint a new trustee to replace Mr. Ghosio. A special election for the final year of the term will then be held in November, said Peter McGreevy. Mr. Russell said the Town Board could even appoint an interim trustee who would then step down to let all non-incumbents vie for the seat in the election. Incumbent Republican trustees John Bredemeyer, Mike Domino and Charles Sanders were all sworn in, as was assessors Bob Scott and Kevin Webster. Betty Neville was sworn in as town clerk, a position she has held since 1997. Justice William Price was sworn in for his ninth term as Southold Town Justice. Fishers Island Justice Louisa Evans was also sworn in. In a past interview, Mr. Price said this will be his last term serving as town judge. Former councilman Vincent Orlando was sworn is as highway superintendent just in time for the impending snowstorm. “I’m looking forward to getting the first snowstorm under my belt,” Mr. Orlando said. KATHARINE SCHROEDER PHOTO | Town trustee candidates at last month’s debate. About him: Mr. Bredemeyer, 62, lives with his wife in Orient, where they raised two children. He is a graduate of Cornell University and has more than 35 years’ experience in environmental monitoring, pollution assessment and public and environmental health enforcement. He formerly worked in the marine unit of the Suffolk County Health Department’s office of ecology. He has worked on numerous environmental initiatives, including building and running a collector for atmospheric nitrogen inputs to the Peconic Estuary. Mr. Bredemeyer was first elected in 1984 and presently chairs to the town’s shellfish advisory committee. He is also a volunteer firefighter. His pitch: Mr. Bredemeyer believes his experience and education with environmental issues has given him the understanding to make valuable contributions to the Board of Trustees. About him: Mr. Domino, 69, has been a Southold resident for the past 17 years. He holds a bachelor’s degree in biology as well as master’s degrees in engineering and education. He is a retired earth science teacher at Rocky Point High School and is currently CEO of Greenport Real Estate Investment LLC. Mr. Domino is a former U.S. Marine, past president of the North Fork Environmental Council and a 15-year member of the Southold Town Anti-Bias Task Force. Additionally, he is a former member of the Board of Trustees of the Suffolk County Department of Parks, Recreation, and Conservation, a certified DEC water sampler and a member of the Southold shellfish advisory committee. In 2012, he was appointed to fill the Town Trustee seat left vacant by current Town Board member Jill Doherty. His pitch: Mr. Domino said that in his nearly two years on the board, he has placed community and environmental interests first, looking for ways to mitigate potential damage to the environment without compromising constituents’ property rights. About him: Mr. Finora, 53, lives in Laurel with his wife and children. He is a self-employed financial media-relations specialist and business writer. Previously a journalist, he has also written two business books and one novel. Five years ago, he establish the North Fork Ospreys baseball team in Peconic. He is a longtime volunteer youth baseball and basketball coach and recently raised money for new dugouts and modernizing the Mattituck High School baseball field. This is his first time running for public office. His pitch: Mr. Finora said he believes in fairness, openness and helping neighbors. He said there is a need for greater balance in Southold’s government and looks forward to hearing and resolving the concerns of Southold Town residents. About him: Mr. Funke, 66, retired to Cutchogue after living in New York, New Jersey, Florida and Germany. He is currently working toward earning a bachelor’s degree in economics and a master’s in environmental science. He spent more than 30 years insuring ships, cargoes and terminals. As a marine underwriter, he was part of the team implementing the Water Quality Improvement Act of 1970. He later went into software and hardware development for several small companies in New Jersey. This is his first time running for public office. His pitch: Mr. Funke believes his experience as a marine underwriter taught him how government and the private sector can work together for a common goal. He said he wants to apply his skills to improve Southold’s waterways. About him: Mr. Sanders, 45, has lived on the North Fork since 1996. He worked at Hargrave Vineyard before beginning a career in real estate in 1999. He previously owned a real estate business and retail store. He is currently an associate broker at Town and Country in Southold. He joined the Air National Guard in 2008 and has served two tours in Afghanistan. This is his first run for public office. His pitch: Mr. Sanders said he wants to contribute a balanced approach to the administration of Southold’s wetlands and the protection of a residents’ right to enjoy their property. About him: Mr. Wells, 60, retired to Southold in 2013 with his wife. He grew up on a farm in South Africa before immigrating to the United States in 1980 and beginning his career in information technology. Mr. Wells was vice president of television information technology at Disney, ABC and Fox. In those roles he was responsible for creating and managing three new IT departments, implementing sales and creating and staffing a new East Coast data center. Mr. Wells is currently working full time on his second novel. His first, “A Fado for the River,” was published in 2012. This is Mr. Wells’ first run for public office. His pitch: Mr. Wells believes his experience in communication and problem solving in the corporate world will be an asset to the Town Trustees. He said he would seek win-win outcomes and work toward making the board’s processes more transparent for residents.